Hardened Operator Control Unit (HOCU). The HOCU is an environmentally sealed 10 DoF tele-operation unit. 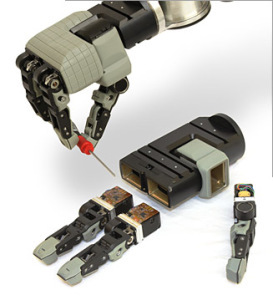 A remote operator can use a single hand to control the three translational DoF for the end effector, three rotational DoF for the end effector, the flexion of the two fingers and thumb, and the opposition of the thumb. HDT’s Hardened Operator Control Unit (HOCU) tele-operates a single arm and end effector. Two HOCUs can be used to tele-operate a dual arm system. The HOCU is an environmentally sealed 10 DoF tele-operation unit. A remote operator can use a single hand to control the three translational DoF for the end effector, three rotational DoF for the end effector, the flexion of the two fingers and thumb, and the opposition of the thumb. A simple communications protocol is used to send commands to the arm and receive information back from the arm. This protocol is compatible with the Robotic Operating System (ROS), JAUS/AS-400, and the U.S. Army Inter-Operability Protocol (IOP). Highly dexterous end effector. A VR glove or HDT’s HOCU allows tele-operators to get the best performance possible from our highly dexterous end effector.